As Sunday gave way to Monday, we noticed that our three “girls”—Pepper, Andie and Jasmine–were a little more subdued than usual. Pepper was kind of walking around with a limp. Jasmine didn’t want to eat her dinner (which Andie all too gladly took care of) and Andie–well, Andie just couldn’t decide where she wanted to sleep. These are serious things when you’re a dog! We often joke that after their morning routine of taking care of business, eating and taking care of business, their ‘rest of the day’ routine consists of an early morning nap, a mid-morning nap, a noon nap followed closely by the important early afternoon nap and wrapped up with the late afternoon nap until we get home! Oh, the torture it is in being a dog in this house! We’ve learned over the years that our dogs are creatures of habit. Hmmmm, we wonder how that came to pass! Anyway, they get up when we get up–well, that isn’t TOTALLY true–WE get up when they wake up! A stop outside followed by breakfast followed by a stop outside (you get the picture?). What’s funny is that EVERY morning after this routine has taken place, Andie and Jasmine head to their crates. Usually, we don’t have to say a word; they just walk in and lay down. Why? Because of routine–they ‘know’ that it’s time to settle in for the day and their crate is ‘home’ for the day. We laugh, but at the same time we smile at their incredible intelligence. How is it that they know to go lay in their crates? Why is it that they choose to go and lay down without a word being uttered? We’ve decided that routines are as good for humans as they are for dogs. And THAT is why we’re writing again tonight–it’s our ROUTINE!!! So tonight we opened a selection from a recent trip to H-E-B, this 2009 Vinum Petite Sirah out of California is an interesting wine. Surprisingly, “this inky plum-colored wine displays ripe plum and juicy blueberry fruit right up front and is backed with cassis and spice. The mid-palate is full bodied with blackberry and over-ripe huckleberry that is cloaked in generous, integrated French Oak that coat the palate and finish with a velvety texture.” This is one review that we actually agree with their interpretation. The color of this wine is magnificent; if you love that deep, dark and royal purple, then this wine is going to get your attention. We’d suggest decantering it for 30-45 minutes before serving; this wine clearly gets better as it’s opened and has time to breathe. At less than $12 a bottle, you won’t break the bank with this wine, and you’ll impress your wine friends who never thought you’d try something so “out of the box”! 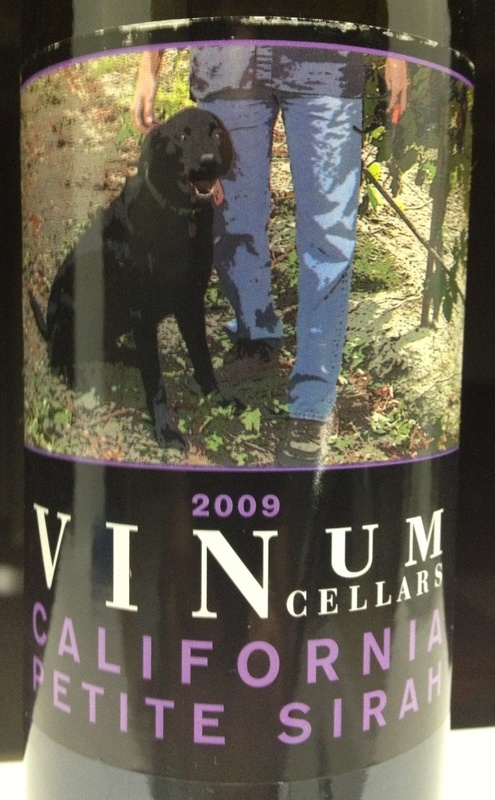 And, if for no other reason, we opted to try this wine because it has a black labrador retriever on the label! Sorry, we’re suckers for black labs having had a very loyal and good friend in ‘Hershey’ as the girls grew up from babies to young ladies. Yeah, dogs help define our lives. . .we remember them like snippets of time in our lives. Hershey was part of the family from shortly before Daughter #2’s first birthday until she was 14 years old. They truly become part of the family and really good friends. Anyway, this 2009 Vinum Petite Sirah–while not the most luxurious wine you’ll ever consume–has character, structure, taste and body–but it will give you a brief respite from some of the boring wines that are on the market! We’d be tempted to buy a few more bottles of this wine, if for no other reason than, to enjoy on the deck with the grill going or the fire pit in full flame or just enjoying the sounds of the evening after a long day at work. . .kind of like a Monday–one for the dogs! Enjoy your favorite wine responsibly and remember to recycle whenever possible! Categories: Uncategorized | Tags: california, dogs, H-E-B, Petite Sirah, red wine, Vinum Cellars | Permalink.